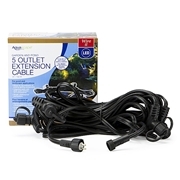 Aquascape 60-Watt 12 Volt Transformer with Photocell includes a photocell and has a programmable timer to shut off in 4, 6 or 8 hours to save electricity and prolong bulb life. The low voltage transformer features a 3' cord and durable epoxy sealed housing. 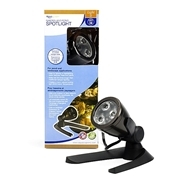 It can be used with all 12v lighting that includes screw on quick connectors. A great transformer to use when manual on/off operation is desired.